Posted on 04/13/2016 in Game Recaps. 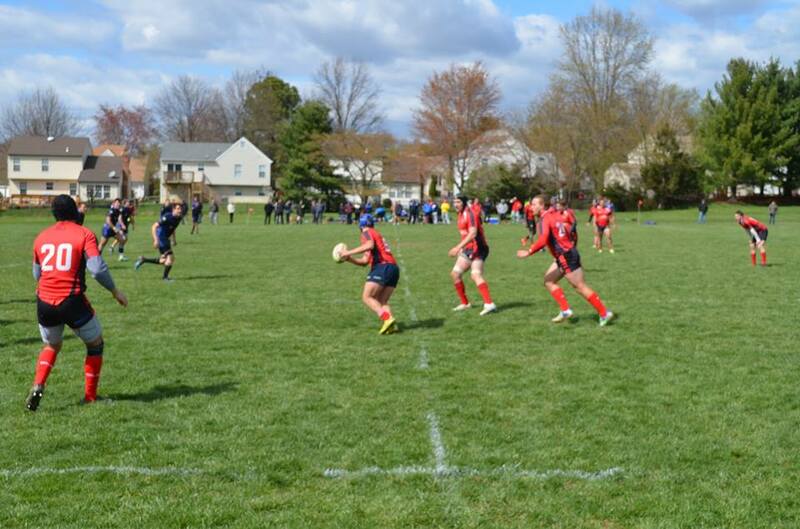 After winning 10 straight against the the clubs of the Mid-Atlantic, Rocky Gorge faced its most competitive match of the season from the defending MAC champions, the Potomac Exiles. After building a 17 point lead about 30 minutes into the game, Potomac battled back to take the lead in the 58th minute at 19-17. Gorge regrouped, refocused, and were able to retake the lead in the 66th minute. An insurance try in final minute sealed the victory for Gorge and earned it the 27-19 win. On a extremely windy day in Gaithersburg, Md., Gorge got the scoring started about 16 minutes into the match making Potomac work from one side of the field to the other. With some nifty passes and a final offload from Tonato Ayigah, wing Cordero Curry scored in the corner. Gorge kept up the pressure working deep inside Potomac’s territory. Starting with a Josh Browneightman pick from a scrum, Nick Sylor found a streaking Matias Cima who ran across the field, broke a tackle, and finally dummied the defender before being tackled over the line for the try. Gorge found themselves in scoring position again ten minutes later. In an attempt to get the wide with a massive overload, Potomac’s Matt Quigley made an illegal knock-on earning him a trip to the sin bin. On the ensuing five-meter tap, the forwards worked the ball for six phases and then Sylor made a move to get it out to the backs. Instead, Sylor dummied the ball inside and passed it back to Nick DiMichele, who found a wide open lane next to the ruck for the try. Matias Cimamade the conversion to bring the score to 17-0. In the 33rd minute, Potomac woke up and scored a short-handed try after lock Robert Newcomb kicked the ball downfield into Gorge’s empty territory. With no Gorge players in sight, Newcomb chased and recovered the ball in the endzone for a try. After the try, the momentum seemed to shift to the Exiles, but they could not add to the score as the half ended 17-3, Gorge. Potomac picked up where it left off attacking Gorge in second half. About ten minutes in as the Exiles pushed inside Gorge’s 22, lock James Rehak was yellow carded and Potomac took advantage immediately. Taking the five meter penalty, the Exiles’ forwards asserted themselves and Robert Garvis scored five phases later to cut the lead to 17-12. Still down a man, Gorge almost scored a short-handed try of its own, but the sequence ended in a penalty. Additional penalty and discipline issues prevented Gorge from scoring again and Potomac used what was given to them one more time. Eightman Jovilisi Fotofili broke the line from a ruck and offloaded to lock Jacob Sprang for the try right next to posts. Quigley made the conversion to take the 19-17 lead. Back to full strength, Gorge refocused its efforts getting back to what made them an undefeated team: defense and solid teamwork. Crisp passing, hard running, and shear determination resulted in the team getting back on track. Matias Cima‘s break got the ball to within a foot of the line andJosh Brown finished the job with the try in the 66th minute. The Gorge defense stepped up in the final quarter of the match repelling each of the Exiles’ advances. In the final minute, Gorge put an exclamation point on the win when Derek Chell kicked the loose ball after a errant pass by Potomac. Players from both clubs chased after the ball and Gorge kicked it again where it rolled to the back of the tryzone. Center Michael Tillman dived on the ball for the final score and ultimately, the 29-17 victory.